In the more restricted psychological field there has arisen as yet no special hypothesis for the explanation of the E.S.P. type of phenomena, excepting those already dealt with under other headings: hyperaesthesia of the known senses, with involuntary whispering (for telepathy) and unconscious reliance upon faint visual indications in the card-calling clairvoyance, were discussed in Chapter 9 and were shown to be excluded by the conditions; and the cryptesthesia or "sixth sense" hypothesis was considered in the last chapter, and was shown to be opposed by a number of damaging facts and to be supported by none. These hypotheses are all psychological in part; but the first are primarily methodological and the last physiological in bearing. I find no other definitely psychological suggestion as to the nature of E.S.P. presented in the literature. However, in the course of this chapter there will be developed some more purely psychological suggestions, taking the form of a partially explanatory hypothesis. But the main content of the chapter will consist of the general mental conditions associated with E.S.P. and their interpretation. Upon such facts must depend whatever advance in the understanding of E.S.P. will ultimately be made. mind; I refer to "concentration". It is not a technical term in psychology, to my knowledge, but it refers to a mental condition that most people fairly well understand and agree upon. Obviously, concentration of attention is implied, and, if one is trying to perceive by a non-sensory mode, concentration of attention would mean withdrawing attention from the sensory fields and directing it into another route. Hence we should have relaxation of all sensory functions and abstraction from all sense-stimuli. This would necessarily accompany the concentration of attention upon a special extra-sensory function. Attention directed into extra-sensory routes would not be so readily observable as sensorially guided attention. The straining of the eye, the listening attitude and the like would be wanting; but we must not be deceived by this appearance of passivity. We find it unmistakably present, as logically it should be for any cognitive process. The evidence of abstraction is itself confirmatory of attention, since abstraction from sensory-stimuli is an evidence of at least some form of non-sensory attention. Let us, then, consider first the facts of abstraction in E.S.P. On the negative side, the role of attention, and effort which is expressed as attention, is likewise well supported. Sleepiness and fatigue, the states opposite to good attention, are demonstrably poor conditions for E.S.P. Worst of all is the artificial sleepiness induced by the dissociative drug sodium amytal. With the subjects under the influence of this drug, there was noticeable difficulty in the capacity to give attention, as evidenced in the appearance of struggle with the task. Pearce got up and washed his face in cold water, he struggled with himself, trying to fight off sleepiness and maintain better attention. Zirkle succeeded in doing this to a great degree when we gave him caffeine and then raised his score level at once from 6.2 to 9.5, making another strong case for the role of attention. This does not exhaust the evidence for the causal function of attention but there is no need to elaborate further. Attention, as the expression of effort, which is in turn guided by interest, is, I think, essential in E.S.P., as in any other mode of cognition. It is probably required even to a greater degree, judging by the apparent delicateness and instability of the functioning E.S.P. is not divided by self-consciousness or self-doubt, and does not partially escape over the sensory routes, then the additional personal interest is drawn into supporting the attention given through E.S.P. If there is this strong effect of motivation upon the attention link and this is so very influential, in turn, with the scoring level, it is very easy to see how Linzmayer might have got his below-chance scoring when I pushed him into working very much against his will, with a definite view to testing whether he would go below significantly (see Table XI, Chapter 5). Given his unconscious negativism, he would have unconsciously opposed the work he was forced into and, without realizing it, he probably responded negatively—actually purposely calling the cards wrongly. Voluntarily and consciously, Pearce and Stuart have called consistently below chance, showing that E.S.P. can be directed by volitional preference in just the way suggested to explain Linzmayer's lowered score test. Guidance and strengthening of attention through changes in interest are the points here involved. If this picture is correct as drawn, then, if interest should decline, as it might well do in any such task, proper attention and abstraction could not be attained, and the scores would drop to chance. Now, after Stuart spent a year of monotonous work at B.T., alone, without the stimulation even of an observer's presence, and without any special recognition or encouragement (I regret now to have to confess), he reported to me that his scoring had fallen off badly! I asked him (the "leading" question) whether he had not gotten a bit tired of it. He confessed that perhaps he had. When I discovered later the amount of work he had done I felt pretty certain he must have grown weary and less interested in the work. And his scoring rate had declined from the first 500 trials on. In these 500, he had averaged 9 in 25, but for the first 1,500 of the total of 7,500, he dropped to 7.1 in 25. The average per 25 for the 5 serial groups of 1,500 trials each are as follows: 7.1, 6.1, 5.7, 5.9, 5.4. The curve of decline is shown in graph No. 7, A in Chapter 14. I am fairly well convinced that it is a curve of "decline of interest," especially by the facts of the sequel. After a few months of "rest" for him, and after I had discovered the excellence of his results, and given him proper recognition for his huge undertaking and accomplishment, I urged him to try again. Certainly he must have been more interested at this point. At any rate, the scoring came back up to 7.3 for the first 400 trials, and then declined again during 2,000 trials and declined by 400's as follows: 7.3, 7.3, 7.2, 6.9, 6.0. After discussing this work with him I became more certain of the decline-of-interest explanation. This work was done by Stuart at his home and was reported by correspondence. The latter part of it was carried on under somewhat depressing and discouraging circumstances, likely to contribute to a decline of interest. Related to the curves described above as probably decline-of-interest curves and giving some support to the view, are the "curves of operation", better described perhaps as attention-curves. Just as we should expect interest, and consequently attention, to decline under some circumstances, so may we also expect greater attention to be given to some calls in the runs of 5 or 25 than to others. With most subjects the first call might be expected to be emphasized by greater effort and perhaps next in rank would come the last call of the run. It would be less likely if the middle call or another in the interior would be especially emphasized. What do we find actually (among such of the data as have been combed over for such internal relationships)? Linzmayer gets the first card correct more often than any other, except when forced into low-scoring, when he got it incorrect more than any other. Pearce, Cooper, Stuart and Linzmayer, in their D.T. work, and Pearce in his B.T.-25 (i.e., run in 25's) all favor the two ends of the run and slight the center. (See Chapter 10 with graphs Nos. 1 and 2.) Miss Ownbey in her D.T. does just the opposite, scoring highest in the center of the pack, and lower toward the top and the bottom. Most striking of the operation curves, however, is Pearce's B.T.-5 curve. These are run and checked by 5's, and they show a rate-of-scoring curve over the whole 25 of the pack that consists of 5 similar units, one for each 5-card-run. That is, there is shown a typical rate of scoring for 5-card-runs that is strikingly regular for the whole 25. Invariably the 2nd call is the highest and the order of the others is quite regular also. See Graphs Nos. 3 and 4 that follow. In Graph No. 3, the number of successes divided by the chance expectation is plotted against the order of the call in the runs through the pack of 25. The curve is broken after each 5 calls to remind the reader that the calls were made in these short runs of 5 each. Each run of 5 is thus a check on the others. In the case of Graph 4, these 5 runs of 5 each in the pack are summated, keeping the serial order intact, as if all had been merely 5-card-runs. First calls are totalled, 2nd calls, 3rd, etc. The curve of these total hits divided by chance expectation (np) is plotted likewise against the order of the call in the run. This gives the complete summarizing curve for the 2,250 trials. counting habits, or some earlier experience with the number 5 may be responsible. More force of conation is put into call No. 2 than in the others. And, as Dr. McDougall would say, more striving in perception would mean increased attention. These are, then, curves of attention-pattern peculiar to this percipient for these conditions. Graph No. 3. 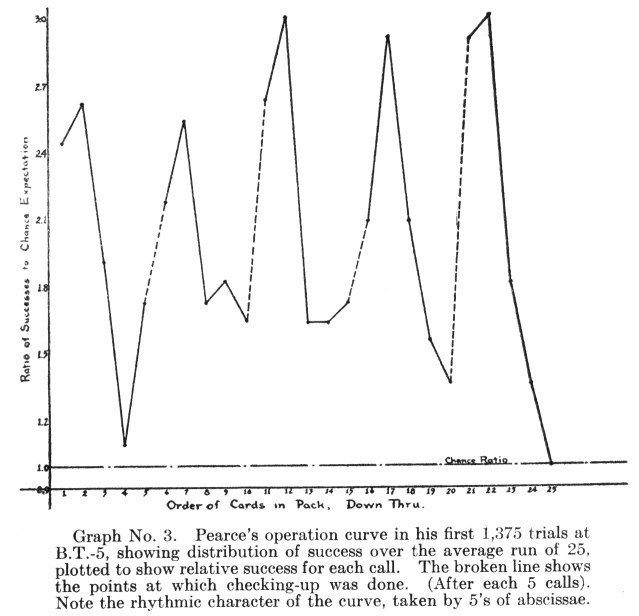 Pearce's operation curve in his first 1,375 trials at B.T.-5, showing distribution of success over the average run of 25, plotted to show relative success for each call. The broken line shows the points at which checking-up was done. (After each 5 calls). Note the rhythmic character of the curve, taken by 5's of abscissae. Graph No. 4. Same as No. 3, but showing distribution of success over Pearce's average run of 5 calls; this represents an average of the five curve-parts of Graph No. 3.
he runs rather evenly by 5's, though within each 5, as Graph No. 3 has shown, there are wide variations on a regular pattern. But on B.T.-25, while there is not such rhythm by 5's, the results would give a general U-shaped curve, a bit W-shaped. But in D.T. his curve is markedly U-shaped. Only the D.T. data have been assembled in this form for the other subjects, due to time limitations and to the greater pressure of other lines of the inquiry. Miss Ownbey's D.T. data are set off by themselves because of their unique distribution and the large number of trials. Distribution of Scoring Rate, over the Run of 25, P.C. do. See Gr. No. 2.
do. See Gr. No. 1. Important as these curves (i.e. the data yielding them) are for their evidence of order and lawfulness in these phenomena, it is difficult at this stage to explain them all. Why, for instance, does Miss Ownbey get better results in the center of the pack in D.T. work than she does with the cards nearer the top and bottom? It is conceivable, perhaps, that she may try harder, gives closer attention, as a consequence of expecting it to be harder to score in the center, and that actually there is no difference in ease of perception—top, center, or bottom. But she herself does not realize any difference or think anything about it. Naturally, since we think she can achieve better abstraction without a close introspective analysis, we let it go at that for the time. The problem is a real one, however, and is still entirely unsolved, except that her results have eliminated any possible hypothesis, physical or psychological, that assumes greater difficulty in the center than in the other regions of the pack. The explanation of such features may well take us back into complex personality factors not yet understood. Graph No. 5. Decline of scoring-rate in long runs. These curves show distribution of success in scoring over the average run. Curve A represents 900 trials at B.T.-100 by Frick, plotted in 5 units of 20 calls each. Curve B, 300 trials at B.T.-50 by Linzmayer, plotted for 5 units of 10 calls each. decline. Both Frick and Linzmayer went on declining thereafter in their later work. series of 900, 950 and 1,300 trials (700 for high, 600 for low) in one day render the fatigue view inapplicable, especially since it was proposed on the basis of data of only 5 calls each. If three of our subjects get through 900 or more trials in one day without fatigue, it is not likely that 5 calls would induce it. 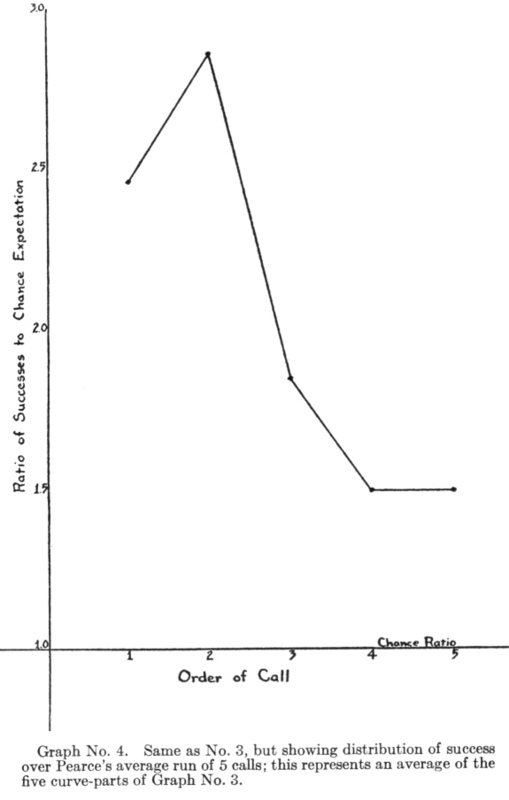 Rather is it likely that Miss Jephson's interesting results represent an operation curve revealing a decline of the requisite "concentration" condition; either the strain is cumulative, rational factors come in, self-conscious attention develops and disturbs, or the like. The first call is usually made more naïvely; but 2 or 3 calls make it harder to keep the intellect at rest, since one is given commonly to reasoning in such matters. The imagination, too, may become too active. 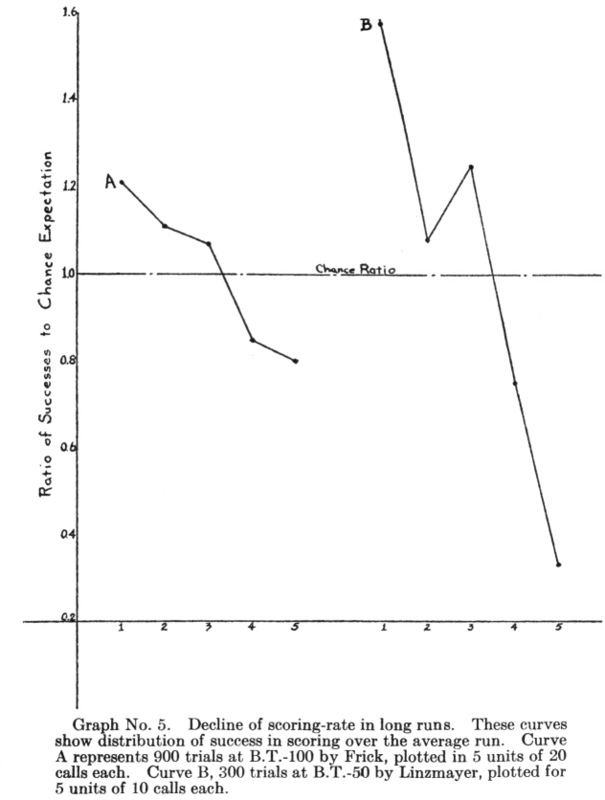 Or the curve may simply be a curve of decline with rising excitement over the experiment's possible outcome. Any of these several possibilities, but certainly not fatigue. We have had decline-curves of several kinds, in the run, in the series, for a season, and for years—but no ascending-curves. We have been interested in learning and development curves too, but E.S.P. does not appear to be a developmental matter, as our data reveal it. It is true there are obstacles and inhibitions that have to be removed, such as initial doubts, self-consciousness, strangeness, distracting environmental conditions. But these might well inhibit the composition of poetry, too, and we would not say that their removal would be primarily learning to write poetry. There is in E.S.P. this secondary learning, obvious in our work, but no adequate evidence of primary improvement of the ability itself. Rather does it seem that we have here a basic function that can easily be inhibited but not developed. It is probably as innately given as is sensory perceptual capacity. This is, however, a point for further inquiry! The general psychological setting of E.S.P. is still very vague. The experiments into this phase have scarcely begun as yet and the subjective exploration has not been pushed; first, because it is difficult to evaluate and, second, we must not, I think, start subjects to thinking too much about how they do it, lest we unfit them for successfully doing it by inducing self-consciousness, over-curiosity or some other undesirable attitude. This has not been regarded as a first-step, anyhow. With this as a preface, I will draw up a brief summary of the mental outlines of E.S.P. good abstraction and close attention to the task in hand. It is less resistant to dissociation than sensory perception or even than simple reasoning. On the points so far mentioned, it is more like creative intellectual or artistic synthesis; yet it is not so fatiguing as these; and, unlike these, can be speeded up rapidly (faster than I can record); and it is not learned or developed, as far as we know yet, as are these; it is unanalyzable introspectively, as are these mostly. But it substitutes for other forms of cognition, for visual or auditory perception, rational judgment or recall. It inter-operates with them, combines in any way and works from a wide range of motivation, for money or for kindness, for play or for display, for science or for courtesy. It is like the sensory functions rather than rational cognition in its lack of development (if this is actually a fact, as it seems). But it is not like them in localization, feeling of real contact experienced, need of orientation to function, resistance to distraction and dissociation. It is simple cognition, so far as subjective analysis goes as yet; but it uses memory, visual or other imagination—in fact, all of mind that is needed—in its functioning. It is normal, not related to mental weakness or disease. In fact, physical disease, of some kinds, hinders it, and weakening, dissociating mental disease would probably do so likewise. There is no suggestion of incorporeal agencies in connection with experiments. As to personality traits and E.S.P., there are some suggestions or general impressions, as yet undeveloped; for example, possible correlations between E.S.P. and a tendency to day-dreaming and high imaginativeness. Stuart suggested a correlation between E.S.P. and artistic interest and ability that seems promising. Hypnotizability, too, is about on a par with these, in correlation with E.S.P. Sociability has a chance, too, of being correlated. But our data are yet too limited on this line of comparison. Relations of E.S.P. to age, race, and other stages and conditions, too, are yet for the future. This, then, is the tentative psychological sketch we have so far achieved. There is much indeed to be said about the bearing such facts as these of E.S.P. may have on psychological theory. It is most obvious that some very fundamental revolution is required in this field by this evidence for E.S.P., quite as it is in Physics. Since there is no end to what might be developed here, in a speculative way, the space must be limited to only a few hypotheses that seem to be more clearly suggested by the facts. A second fact that suggested this hypothesis is the relative indifference to the percipient's success, on the whole, as to whether it is a card or a thought-image that is to be perceived. (The data for this conclusion will be summarized in the next chapter and not repeated here.) The diversity of the "stimulus objects" here is so great as to suggest that the agency responsible is the percipient's mind—that his mind, in effect, "goes out to" the object. Such different objects could not be expected to give such similar stimulation. It is much more reasonable to suppose that the percipient's mind can perceive in E.S.P. fashion a wide enough range of "objects" to include thoughts and cards. It is this "going out" to perceive that points in our present picture of mind-body limitations to a relative independence of the material laws, as known. A "going out" to great distances in defiance of "inverse square" laws that all known matter-bound energies obey, as well as a "going out" to a solid pack of cards and the selection of the right ones in the right order; and, again, a "going-out" first to the right mind in a heavily populated region 250 miles away and selecting its thoughts, while evading doubtlessly similar thoughts originating nearer the percipient (circle, star, plus, etc. ), selecting from the chosen agent's mind not the thoughts arising from her reading the book before her, but the very images intended for the very moment when the call is made; and, finally, a "going-out" of mind that selects one card on a table 250 yards away, when there are hundreds of similar cards in adjoining rooms that are nearer the percipient, many others in his own room and in the observer's room—such facts and conditions come close to persuasion of the necessity for the active and selective agency of the percipient's own mind, in escaping the limitations of its material nerves and sense organs, penetrating stone walls and evading distance, and accurately apprehending the desired "object" on a level or scale or condition that is non-material and non-spatial. The third fact suggesting this hypothesis of relative independence of mind from material properties is rather a whole set of facts; namely, those given in Chapter 8, showing that, in P.T. work with good E.S.P. subjects for agents, better results were obtained than when poor ones functioned, with the same percipients for both. This suggests, along with the fact that even with poor E.S.P. subjects for agents a good percipient could score in a mediocre way, that the "double agency" of two good E.S.P. subjects means a capacity in both to "go out" to meet each other beyond the material and sensory range. That is, the demonstration of the greater advantage of having an agent who is gifted with E.S.P. ability showed that there was a "going out" on her part, a "meeting half way", or joint agency. It would seem to me, therefore, that this Capacity-to-Escape-Material-Conditions-Hypothesis might be regarded as having at least a good beginning in plausibility, with no strong competition; but, nevertheless, as resting on relative fragments of fact and constituting only a "working direction" at present. This general hypothesis embraces at least two more special ones, which, I think, may be better stated independently. First, the agency 1 of the percipient's mind in "going out" to the perceived object or image-source, instead of merely receiving incoming energy patterns emanating from the card or the distant agent. The facts suggesting this view have been given above. The second hypothesis involved in the larger one is that of the relative or partial freedom of mind from the limitations of material and its property, space, as shown in the E.S.P. phenomena. Both these (the agency of the percipient's mind in E.S.P. and the spatial freedom of mind) have been involved as phases in the discussion above, and need here only be mentioned as separable units that need to be criticized and tested, each on its own merit. Together they harmoniously fit the facts in their present incomplete state and give us the rational picture of the purposive mind of the percipient operating between two energetic orders, one related to the spatial world and another not directly related. There is thus a perceptual interweaving between these realms of reality, something like the clever play of the switch on a radio-victrola set can interweave from two widely different energetic sources two musical themes into one. So may (still hypothetically speaking) the E.S.P. subject look at his watch (contact with the spatial world) and call the card 250 yards away or get an image 250 miles away (thru a hypothetically non-spatial world). I mention this speculation merely as the play of the mind about and upon these interesting facts. It seems to be the only rational line of treatment that fits the facts we have. In much less important, though more practical, ways these results bear upon the techniques and theories of psychology. We have pretty good ground in these results to suppose it possible that in hypnotic suggestion there may well be an extra-sensory component of rapport that satisfies, in some respects, the old "Mesmeric fluid" theory. It would not, however, be correct to imply, even hypothetically, that some extrasensory perception from hypnotic agent to subject is required—merely that it is a possible factor that may hasten and aid good trance and good response. As such it may play a minor but effective role. It has already the support of Alrutz and Richet in the more modern period of the history of hypnotism. Again, we have the problem of E.S.P. as a possible spurious factor in the experimental laboratory. If we can get such good responses to mere thought-stimuli as 26 straight hits between Miss Ownbey and Zirkle, or 23 and 22 with two walls between them, what degree of safety is there in most of the conclusions of much of the experimental evidence obtained in situations where the observer, screened as he may be, is thinking of how he would like the subject to respond? And, in view of the work of Bechterew on dogs and of Rhine on the horse already referred to, what shall we say even about animal studies? Again we are asking questions in an hypothetical spirit. We cannot answer them at present but the burden lies considerably on those who are offering results exposed to the criticism of these merely hypothetical questions. I am not, myself, disposed to question on this ground any great amount of psychological experiment but it is, nevertheless, a matter that we can ill afford to neglect. 132:1 In Mental Radio, already referred to, Mrs. Sinclair, the percipient, describes very fully her introspections and her views as to the way "telepathy" occurs. She emphasizes relaxation of body and "blankness" of mind as requirements; these constitute the negative or abstraction phase of the "concentration" required. Later she mentions the need for "training in the art of concentration" and thus adds the positive effort phase. She, like Osty, Tischner, Myers, etc., attributes the positive activity of this mode of perception to the subconscious level of mind. Mrs. Sinclair has also many excellent practical suggestions for the prospective E.S.P. subject. 133:1 I would predict that with most E.S.P. subjects initial failure would be highly probable if they were to be taken before a committee; failure would be practically certain if the committee were made up of impressive people, or if its members did anything to excite or distract the subject. To impose even little precautions at the start is hazardous. Placing a small screen over the cards that Pearce did not look at often anyway stopped his E.S.P. for a time—until adjustment took place. 133:2 Supernormal Faculties in Man, Dutton, N. Y., 1923. Pp. 124, 161, etc. 139:1 This work is inserted since the first writing of this chapter, since it has just been performed. Cooper has only recently undertaken D.T. seriously. 141:1 Jephson, Miss Ina, Evidences for Clairvoyance in Card-guessing. Proc. S.P.R., Pt. 109, Vol. 38. pp. 223-271,1925. 145:1 Dr. Osty's frequent insistence that the percipient is "not passive" is a supporting judgment of great weight, coming from an observer of the many years experience which he has had. Op. cit., p. 161. 146:1 A case of the practical use of telepathy as a method in psychotherapeutic exploration already on record is related briefly by Dr. Prince in B.S.P.R. Bulletin 20, p. 66. The consulting psychologist was Dr. Thos. P. Bailey of Rollins College.